Did you know that February 26th is Levi Strauss' birthday, http://en.wikipedia.org/wiki/Levi_Strauss. 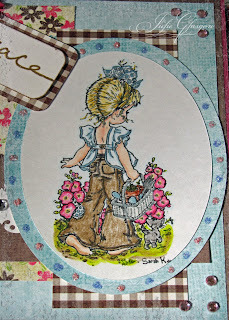 Our challenge this week at Embellish-It Scrapbooking this week is to create a birthday card or any occasion card for someone inspired by ads of the jeans, using pictures with the jeans or a part of jeans/tag/pocket/buttons. So, my card is more of a general card than a birthday or occasion card, though will be given on the occasion of our church retreat this weekend. I wanted to piece the jeans into my image. I used cut up jeans that used to belong to my daughter and were damaged to the point that they could not be given to the thrift store. I had one dark pair and one very light pair. So I mixed them into the image. I love the dramatic contrast. 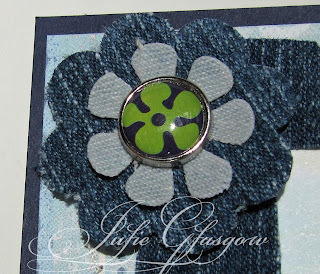 I used Mod Podge to stiffen the jeans, and then sent them through the Big Shot with a frame die and flower dies to create jeans flowers. The brad is from Basic Grey. 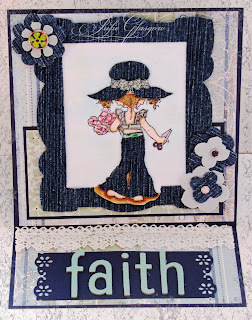 I used the Thickers and lace on the inside of my card to help hold up the easel. I love the contrast against the navy blue. 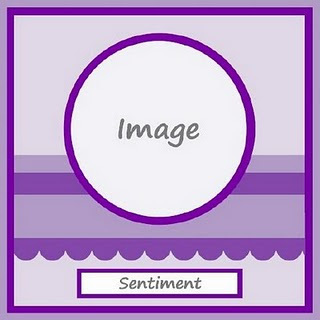 Reminder - Embellish-It Scrapbooking has a great deal on ribbon right now. 1. Each customer who purchases $5.00 in American Crafts products will receive a spool of ribbon. 2. For every purchase of Thickers, you will receive a free spool of American Crafts ribbon. So, if you buy 3 packs of Thickers, you get 3 spools of ribbon for free. PLUS - Free shipping on orders of $50.00 or more! 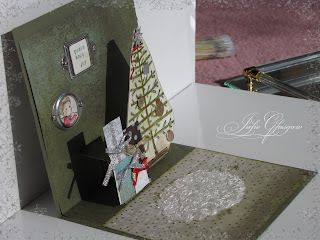 Welcome to the second installment of our monthly Magnolia-licious Christmas Card Blog Hops. This group was created for Magnolia lovers who want to get a jump on the Christmas season by creating a Christmas card each month. If you are visiting this blog hop, I hope it will inspire you to get ahead of the holiday season and join us in our endeavor. 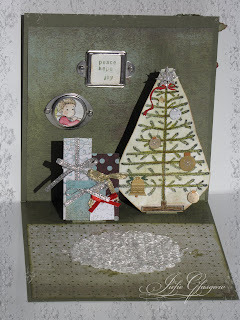 The blog hop will start at Christmas All Year Long Magnolia-licious Yahoo Group. If you get lost, the list of all players will appear on that blog. From here, you will go to Aletha's blog. 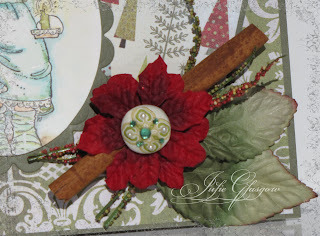 Accessories: Prima Leaves and Flowers, Spellbinders, Cinnamon Stick, Dew Drops, K&Co K-ology brad, Seeded Grass (Walmart), Jolee's stickers, Hodgepodge Hardware. I went all out with the flower. I wanted to add the cinnamon stick, and the brad worked perfectly to hold it in place. The seeded grass came from Walmart and was in the after-Christmas super sale stuff. For my pop-up, I wanted to create a living room scene for Christmas Morning Tilda. I found some paper that looked a bit like carpet, and have some thick fuzzy ribbon that looks like a fur rug. I cut some random rectangles out of scrap paper and added ribbon for the gifts. The tree is decorated with some left-over Jolee's stickers. I used Rose Edwin to make a picture for the wall because he is so small. His head fit perfectly in the frame. I really had so much fun with this pop-up. It is so much easier than it looks. 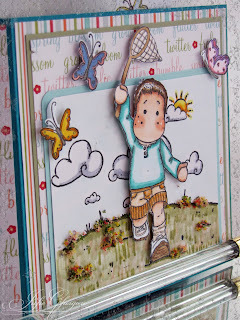 There are some great links on the Magnolia-licious Highlites blog for pop-up tutorials. Now, for the hop, you need to go to Aletha's blog. I hope you enjoy our blog hop! And get going on those Christmas cards. Christmas will be here again before you know it. 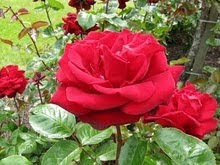 If you would like to join this great Magnolia-licious Yahoo Group, you can go here to join. 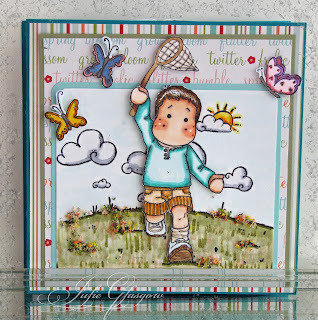 If you would like a great source for Magnolia Stamps, check out Magnolia-licious. The selection is great and she has wonderful customer service! 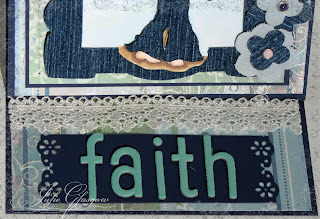 Check back tomorrow for my entry for Embellish-It Scrapbooking Friday Challenge using Levi''s. Howdy! I hope you are having a fantastic week so far. 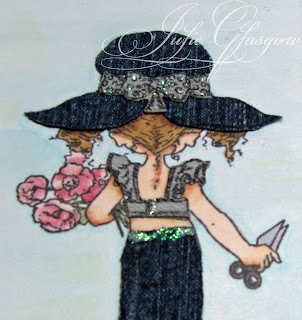 I joined the Paper Craft Planet group for Sassy Cheryl's Digi Stamps. I am just crazy about these stamps. 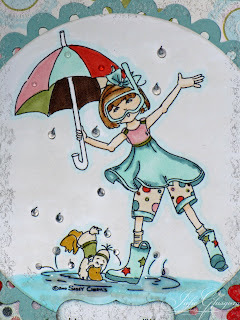 She has such a fun, whimsical style. 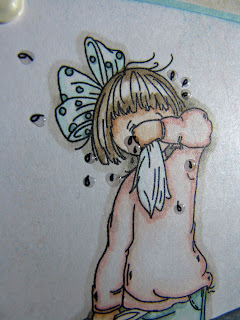 Yesterday, it just seemed like so many on the group were not feeling well or had sick kids. That inspired me to make this card. I used paper that I got from Embellish-It Scrapbooking called Pink Paisley. I colored my image with Copics. I colored her shorts to match the spotted paper on the card. I really wanted to get the effect of the water, so I used Crystal Effects on the rain drops and the puddle. I can't help myself. I will probably have to do that every time I use this image. 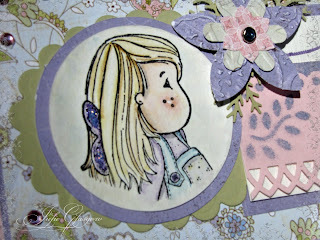 Pink Paisley has some really cute brads called Bella Brads that match the spotted paper perfectly, only in a mini form. Now, I must confess that I did not have that particular brad on hand, so I had to make my own. 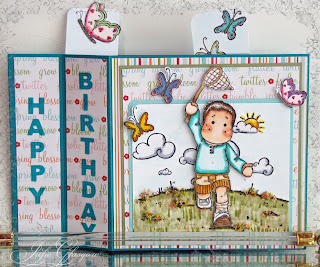 I used the Build A Brad by Stampin' Up! I punched out two circles from the Postcards paper by Pink Paisley. I glued to the brad and covered with the acrylic circle. I like this because it adds more of the water effect to the card. 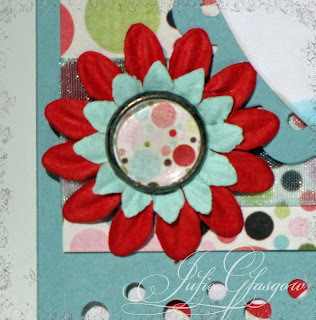 What a great embellishment for my Prima flowers. I knew what I wanted to say, but lacked the sentiment stamp, so I created my own. I made this in Word 2003 and printed it out. 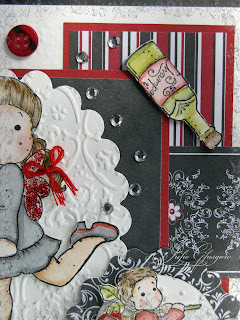 I used my label punch to punch it out and colored the edges with Baja Breeze and Chocolate Chip ink (Stampin' Up!). I am hooked. I will likely make a whole selection of sentiments for myself. The special on ribbon continues at Embellish-It Scrapbooking. 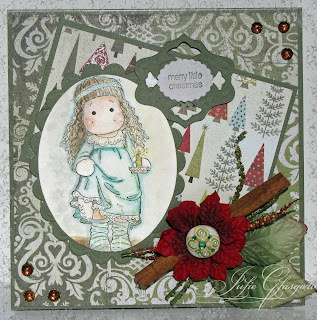 Check back Thursday for Magnolia-licious Christmas All Year Long Blog Hop. See you then. Howdy! I hope you are having a great weekend. When I first saw the challenge, I had the idea of Edwin chasing butterflies and the butterflies flying up out of the card. This was the result. How fun is this card? It is super interactive, bright and springy. It is such a happy card. 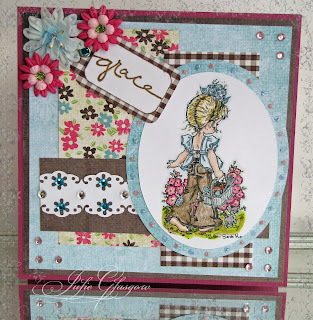 You just have to love those sweet Magnolia stamps. I used just one piece of paper from Twitterpated, and I did use both sides. This was a new technique for me, but it will probably not be the last time I make one of these cards. They are just so fun. I colored my image with Copics. I used Crystal Effects to add a water effect to the tears. I built up my flower and finished is off with a Basic Grey Glazed Brad. WOW! We all like to get stuff for free, right? 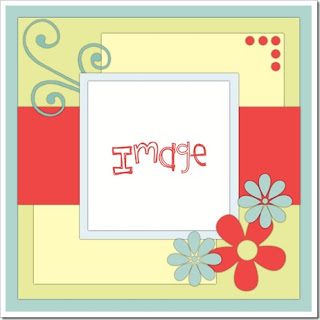 Go see what Embellish-It Scrapbooking has for you. 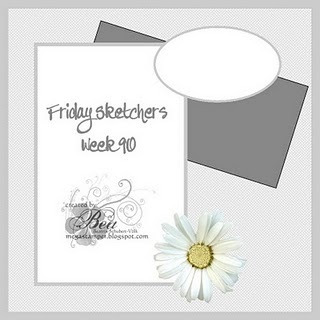 I hope you will consider joining us at Embellish-It Scrapbooking for our Friday Challenge. I made this card for several challenges. 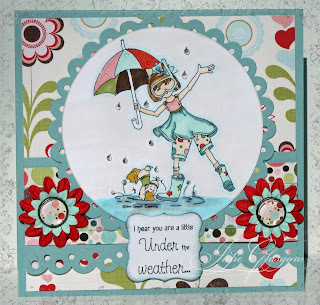 Have you heard of the challenge blog called Pile It On? Their challenge is to add as many challenges as you can to your project. How fun is that. 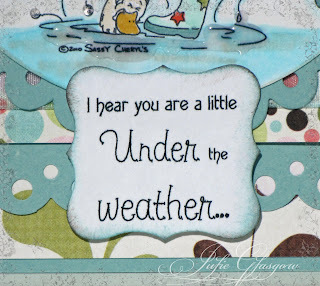 Stamps: Little Land Swimmers (Sassy Cheryl's Digi Stamp), Sentiment Stampin' Up! 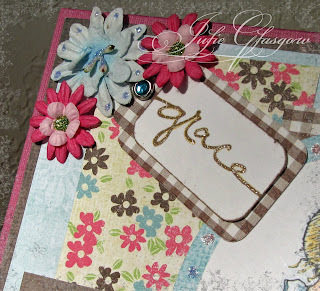 To cover the challenges, I used Prima's and some other flowers from my stash for the Pile It On challenge. 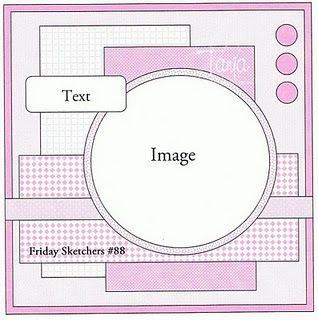 The digi stamp I used is brand new for the ABC challenge. 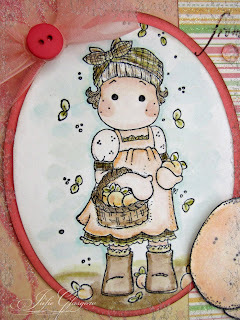 For the CRAFT challenge, I colored by digi stamp with Copics. I colored my image with Prismacolor pencils and mineral spirits. I actually colored my image last summer, and this is the first chance I have had to use it. 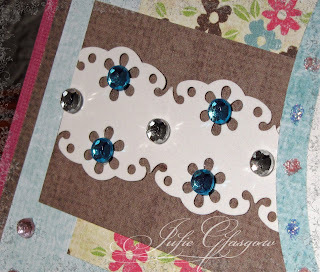 I punched white cardstock on both sides with a Martha Stewart Punch and embellished it with blue and white rhinestones. I used pink rhinestones in the corners. 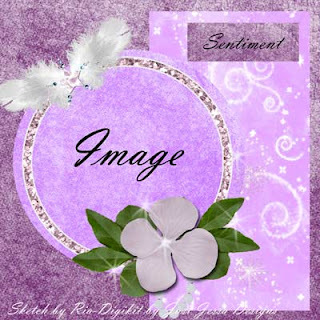 I used stickles to decorate the flowers and the border for my picture. For just a little more bling, I traced over the word "grace" with a Copics Spica Pen. It is hard to see in the picture, but really glimmers in the sunlight. 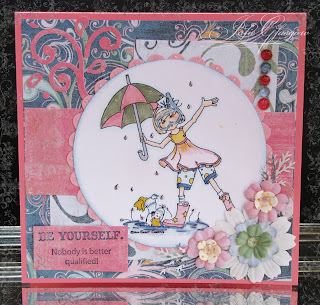 The Cuttlebug Challenge is to use a mask and Glimmer Mist, and use an embossing folder. I colored Tilda with Distress Ink. I punched the Floral Vine Martha Stewart Border Punch and punched a mask. I laid the mask over the pink card stock and sprayed Glimmer Mist over the mat, creating the image on the pink card stock. 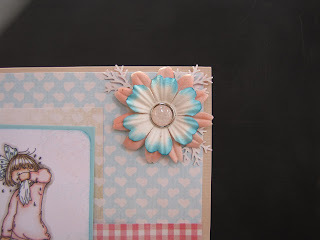 To incorporate the Cuttlebug Embossing Folders, I embossed three small pieces of Basic Grey paper and used flower punches to create the two flowers. Hope the rest of your week if fantastic. 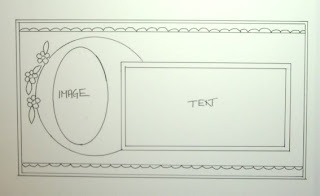 Isn't this sketch from Sketch Saturday just lovely. It could be a card on its own. 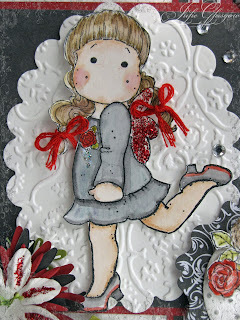 Embellishments: Organza Ribbon, Dew Drops, Bazzill Button, Fun Flock, Copics ABS. I am totally hooked on coloring with distress inks. I love to blend the colors. They work just beautifully. An added bonus is the brush is really easy to clean between colors. 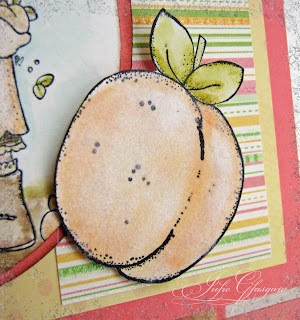 I used distress ink to color the peach. I then used Two-Way Glue to adhere some white flock to the peach to make it fuzzy. I used my Copics Airbrush System to color the flock peach. I love the effect. My card today covers 3 challenges in one. The picture on the left is the celebration pictures. The picture on the right is the inspiration. 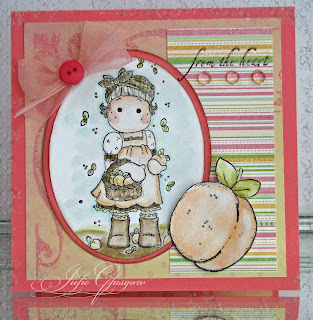 The second challenge is from Magnolia Stamp Lovers #3 - Buttons or Bows or Both. 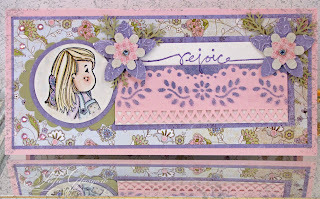 Embellishments: Daisy dye cut, Prima flower, handmade roses, Spellbinders labels, buttons, DMC floss, Stickles, rhinestones, Cuttlebug Embossing Folders, Fiskars Texture Plate. I water colored Tilda with Distress Inks. I added blue, green and purple to her black dress to give it some dimension. I added the red soles to the shoes to make them Christian Louboutin shoes. Here is where the champagne bottle comes in. Since I first saw this stamp, I pictured her kicking up something with her foot. 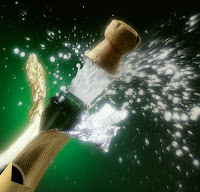 When I saw the champagne bottle, that was it. I added the rhinestones for movement. I hope you enjoyed my creation. Have a great weekend. 32 comments that make blogging fun!